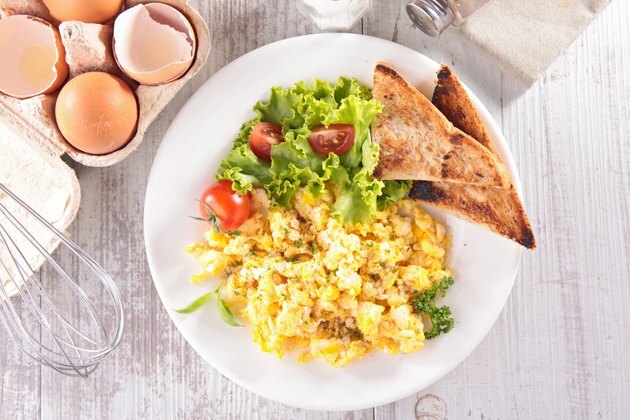 Scrambled eggs are a staple of many people's diet, and one of the reasons they are widely eaten is the different ways you can customize your dish. The eggs provide a fairly basic template to which you can add different ingredients, such as cheese, salsa or sour cream. Sour cream makes the scrambled eggs a bit richer than usual, adding a distinct flavor and creaminess. Ingredients that you would traditionally pair with sour cream, such as chives or onions, go better with the scrambled eggs when there is a bit of sour cream in the dish. Beat the eggs and sour cream together, whisking together until the mixture is a uniform color and texture. You can add as little as a few ounces of sour cream for every dozen eggs you use, or up to an ounce of sour cream for every egg. The ratio depends on how creamy and rich you like your eggs. Melt butter over a hot skillet so that the egg mixture will not stick. Pour the egg mixture onto the hot skillet, and use a spatula or wooden spoon to push the eggs around in the skillet once they begin to stick. Push the eggs to one side, and allow the excess runny egg to run to the open side of the pan, repeating until the eggs have formed curds and are fully set. Salt and pepper to taste, and add garnishes such as paprika or green onions as desired. Avoid stirring the eggs constantly as you want to allow them to set. Rather, fold and break the large chunks of eggs as you cook. Make sure you remove the eggs before they start to burn, as burnt sour cream has an especially unpleasant taste.